Native advertising was a hot topic last year and is already causing quite a stir again in 2014. But in truth it's a bit of a buzzword - if we take 'native' as meaning anything that takes on a publication's persona, almost morphing into existing editorial, then the concept has been around for years. So what’s changed? The way I see it, the whole concept of native ads can be attributed to the same digital revolution that’s happening to the rest of the industry as we speak. As technology and consumers get smarter, the techniques for engagement are becoming more subtle and sophisticated, to monetise relevancy than ever before. How many of us even notice banner ads when we click on a website nowadays? The likelihood is that you, like me, scroll right past them to find the content you were actually looking for. With a saturating amount of content available on a plethora of devices, we are experienced navigators weaving our way through a maze of irrelevant advertising. As an industry we’re seeing average banner click-through rates drop consistently every year. In the majority of cases, the old school method of putting your message under your audience’s nose just isn’t good enough anymore. Brands must be innovative if they want to be noticed, and that’s where native advertising comes in. As a premise it hasn’t changed, but the technique does demonstrate the industry waking up to consumer apathy and experimenting with a bolder, more conscious approach – people want brands to add value to experiences rather than detract from them. The search advertising guys have already hit the nail on the head. Whether we’re talking about Google or Bing, the ads you’re served when using search engines look just like all the other blue links you’re used to seeing. They’re completely in the context of what you’ve just typed, are tailored to your search query, and often alert you to a choice that’s perfect for you but that you might not have otherwise considered. One of the most high-profile recent examples of native advertising comes from the New York Times (NYT). A hugely successful newspaper in the US, the move was criticised by some who cited a conflict in interests between the team of journalists and the brand – in this case, Dell. 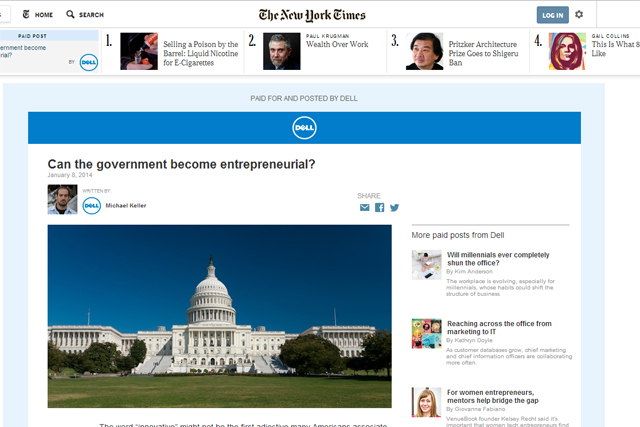 The question of how the NYT could hope to be impartial when reporting on Dell news in the future is a good one, and highlights the legal questions around native advertising. But with the challenges come vast opportunities for innovation. As consumers demand interactions with brands to be more immersed into their experiences– not just across the web but in newer engagement platforms such as apps – we as an industry must develop new formats in order to challenge existing thinking. In-app advertising is still relatively new, however, and with many developers scratching their heads as to how they can provide anything more than annoying banner ads, it poses the question ‘what will the future look like? Microsoft’s Ads-in-Apps, which run on Windows 8 on desktop and tablet, is an interesting initiative helping to explore this potential. Brands including Warner Bros. – which ran an ad for the most recent Hobbit film inside our video app – are taking advantage of this format. The future will see brands combining this knowledge with consumers’ data in real-time across screens, providing something genuinely bespoke. This convergence of big data, native advertising and the hundreds of thousands of different apps on the market has such potential, and this will be an exciting focus area for brands in the coming years.